The municipal archaeological service in Dordrecht (Netherlands) recently found some old playing cards under the floorboards inside a bar formerly called ‘Hof van Holland’, located at Kuipershaven 11 in Dordrecht. Second only to antique book bindings, this is a favourite location to discover old cards. This shop/bar was active between c.1650 and 1800. The venue was sold in 1807 whereupon the first floor most likely was no longer used as a public space. 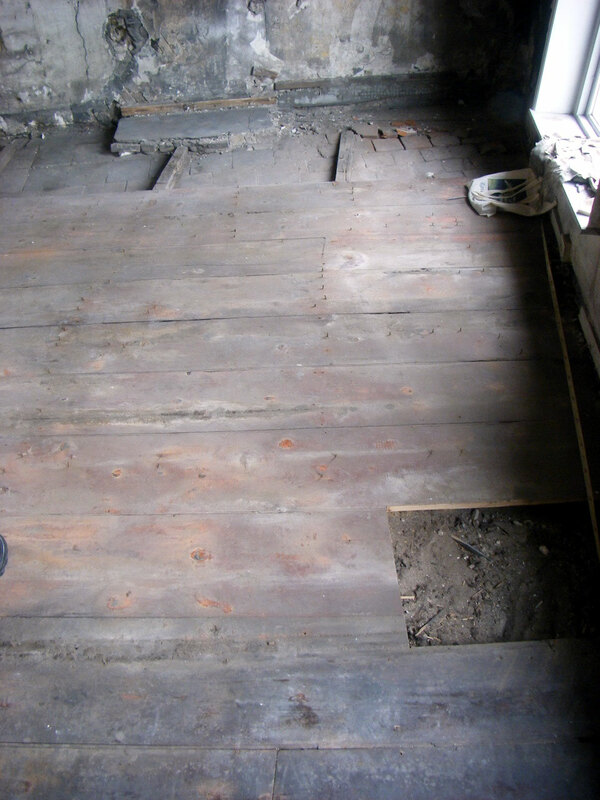 Above: the location under the floorboards where the old playing cards were discovered. Above: the bar was located at Kuipershaven 11 in Dordrecht. 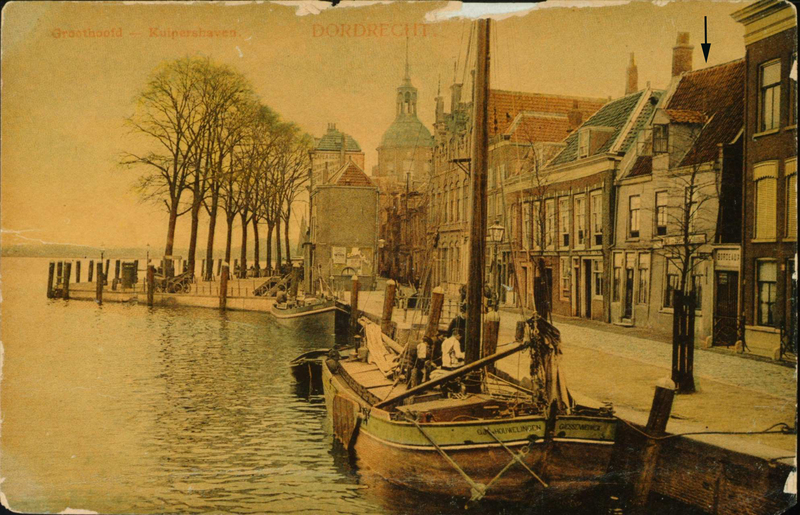 The left-hand view shows the building on an old postcard, dated c.1900-1906, reference: RAD (Regional Archive Dordrecht) inventory nr. 552_402007. The right-hand photo is a picture of Kuipershaven 11 as it is today. On the first floor there were two floors. 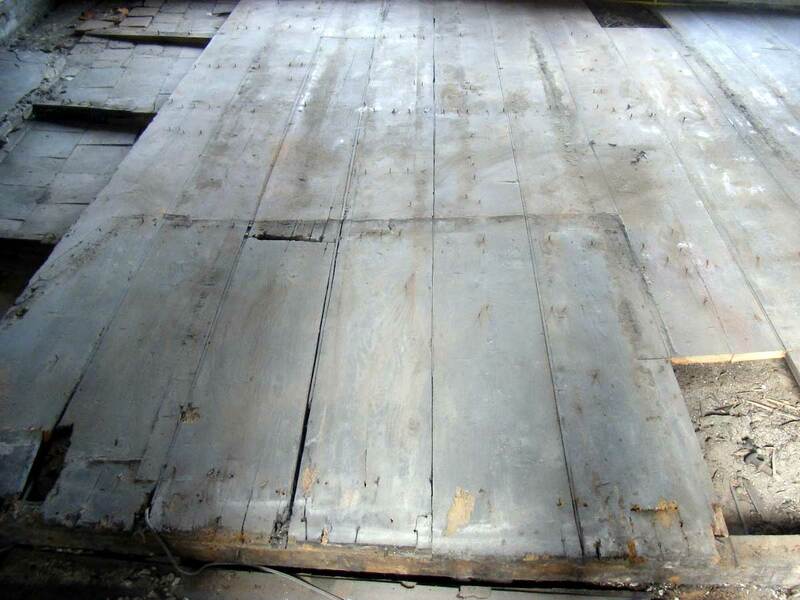 The first was a tile floor which can be dated between 1580 and 1688. The second was a raised wooden floor. In between was an open space which served as an “artefact-trap” for all the small items that disappeared between the cracks in the floor. We found a rich find among which are smoking-pipes, coins and playing/game-items such as these cards, dice and wooden game pieces. 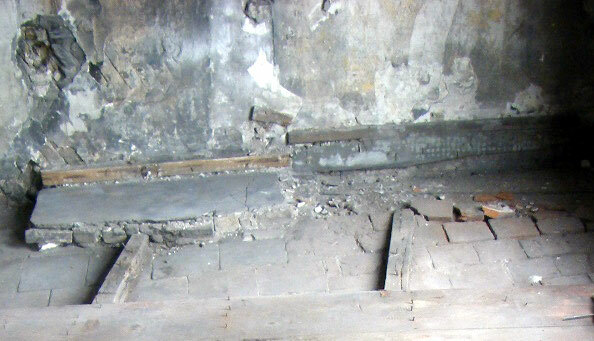 Above: photograph of the situation on the first floor during our research, which shows the older (16th-17th century) tile floor, the subsequent wooden floor (start 18th century - 1939) and the sand/dust layer in between in which the cards were found. 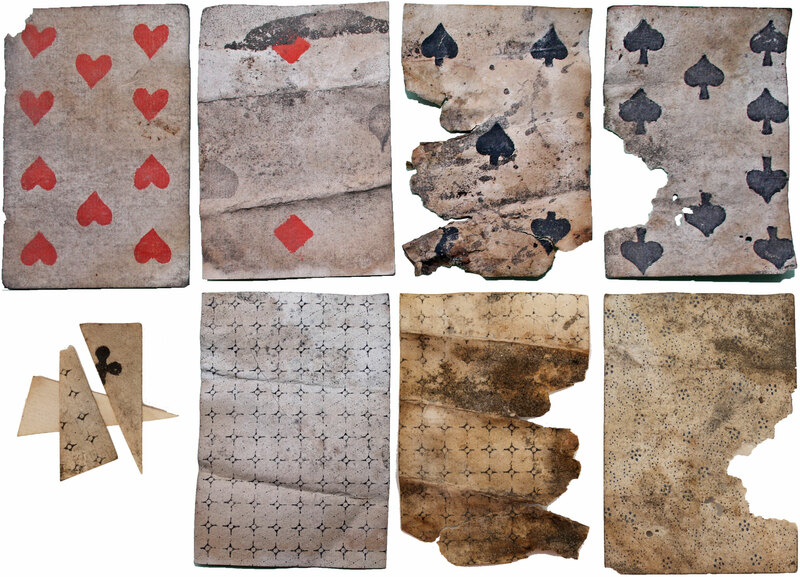 Above: five fragmentary playing cards discovered under the floorboards belonging to two similar decks. (Click image to zoom). The spades symbols have a slightly different shape in each deck. The cards can be dated from the first half of the 19th century, that is 1800 - 1850. The back patterns are repeating motifs produced by a mechanical method, "stars" or "dots-and-stylistic-flowers". The pip cards are double-ended rather than single-ended and without index numbers. Because there is a ten of hearts then we may assume that the complete deck(s) contained 52 cards: A-10, J, Q, K. In the small triangular fragment (bottom left) with a club symbol, the three layers of card have become separated. This is of course the completely normal manufacturing method. Coins from the same context date until the end of the 18th century and we know that this shop/pub was sold in 1807 whereby the first floor most likely was no longer used as a public space. Thanks to Jean Darquenne for assistance with dating the cards.